Maggie's First Dance Block 2 and Giveaway! Today is also time to celebrate with Jacquelynne Steves Maggie's First Dance Block number two! Last month for the first block, I made the decision to try thread painting. I was so very pleased with the results, I am continuing the process with the remaining blocks. The first block, I had significant puckering on the center block with the thread painting. I was looking for solutions to easily solve the issue. 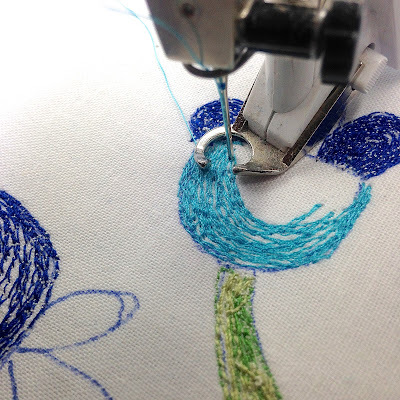 Last week, I stumbled upon a video of a man using his vintage Singer treadle sewing machine and an embroidery hoop to create intricate embroidered designs on clothing. I did not have any other brilliant ideas to fix the puckers, so I decided to give it a go! The hoop made the thread painting so much easier. The BSR on the Bernina is pretty sensitive and can start and stop abruptly at times when I am not expecting it to happen. With the hoop, it seemed to happen much less. It was much smoother. It was also easier for me to maneuver the hoop. The maneuverability made it significantly easier to control. For these flowers, I used fewer thread colors than for Maggie's First Dance Block One. I wanted these flowers to be more bold. I used Aurifil 50wt for the flower heads and for the stems, I added in Aurifi 28wt. I was curious if it would work for thread painting. It was a breeze. To use Aurifil 12wt is not difficult. Use 40wt in the bobbin and I used a 90 needle ( it was the one already in the machine). It was dreamy! 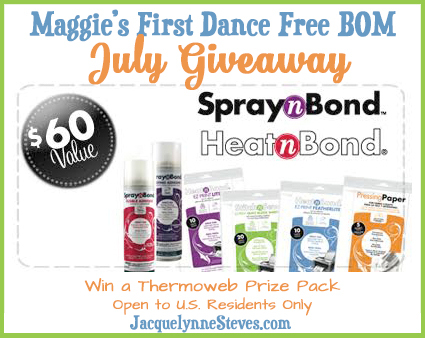 The GIVEAWAY for July is sponsored by Thermoweb! This will be open to US residents only. The prize contains aerosols which cannot be shipped internationally. To enter for your chance to win this amazing giveaway, leave a comment answering the question: How do you spend The Fourth of July? This giveaway will close June 11. The random winner will be notified on or about June 13. If you are a no reply blogger, please leave your contact information in your comment. For our international friends, there will be a separate giveaway! 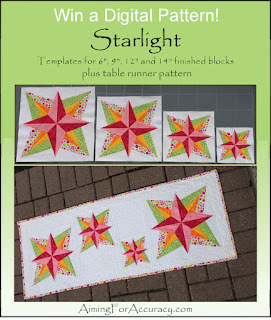 To enter for your chance to win the international giveaway please visit the Quilting Gallery Blog! We usually watch the fireworks on TV because I have to work the next day and it takes too long to get home from the fireworks display. This year it has been raining off and on all weekend, so we might not have fireworks tonight. Sure hope it clears up and we can! Every year we used to spend it with my hubby's family. Big picnic and fireworks off of the lake. But since my in -laws have passed, we either spend time with our kids or with friends. Thanks for the great giveaway! We don't usually do anything special for the 4th of July. It's just a low key day around the house. Hubby and I will spend some of the day paddling our canoe on the lake. The rest of the day will be quiet, too. I'll be pleasantly sewing. Early to bed...have to get up early for work in the morning. We will grill burgers and watch fireworks. It is gray and rainy here- my husband will grill dinner and I will quilt! This year I am spending my 4th of July cutting, quilting, and sewing!!! We have a fireworks show that we see every year. That was last night. We will have dinner together. Our 9-year old son will be running back and forth between me and my quilting activities and my husband working on something in the garage. This is the way we LOVE to spend our spare time. :) Happy 4th! What a pretty block! I am really enjoying this quilt along and following the blocks as each is so different and creative. We are empty-nesters here, so our 4th of July is more on the quiet side. We will grill some brats and enjoy them with some other treats. I like to take an hour or two and trim the bushes too! Woohoo! I will be spending the day with my family. 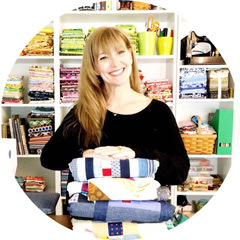 I am a new quilter! Love seeing your thread painting and trying t understand different uses of the aurfil threads. 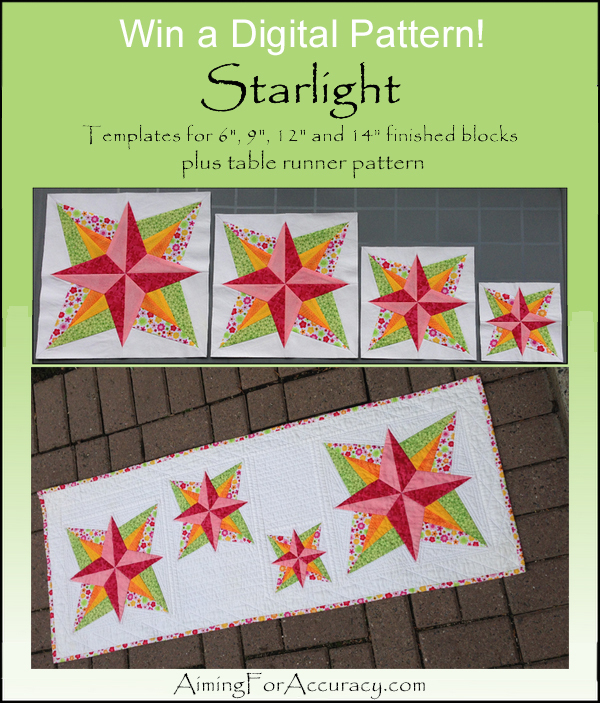 Who is the designer of the fabric you used in the quilt block? It is so cheerful and lovely. We usually float the river nearby in a canoe. Today is suppose to be pretty windy so we decided not to take the risk, instead we are having friends come over for a BBQ. I love your thread painting. It looks awesome. HI,cooking out and enjoying family+friends around us! It's raining this year but we are still going to BbQ and watch movies. We spend the 4th with friends, watching the fireworks from my front porch! We spent it chilling at home-which was great! I'll call my sister and wish her Happy Birthday. Other than that, it'll be a pretty normal day -- I want to get into the sewing room and work on my quilts from two June workshops. A day for me. Yesterday, I baked bread and red, white and blue bundt cake for a friend's annual potluck picnic. 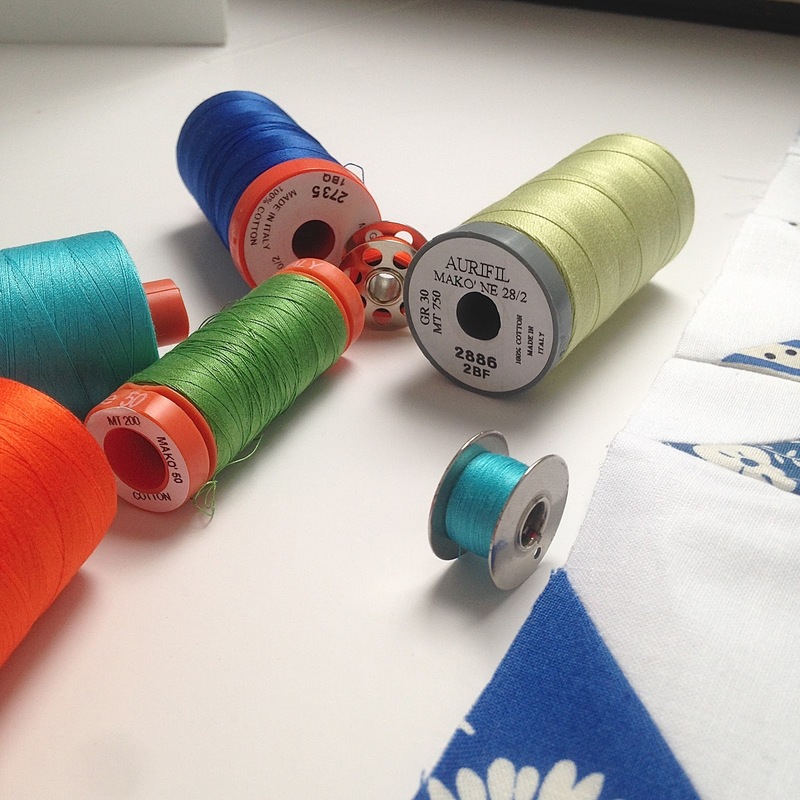 Today I sew!!! Today I'm spending the Fourth very quietly and peachfully. I hope to rest up for work tomorrow. We watched our town parade and are spending the rest of the day with family. We watched fireworks last night at a friend's house (they have a fabulous view of Deer Lake, WA! ), and tonight is fireworks at our lake (Loon Lake, WA). Oh, and I think I should grill some burgers and make some potato salad sometime today, too. Happy Birthday, America!! We're spending the day indoors out of the heat; we'll have an indoor picnic of hotdogs and potato salad for dinner. We celebrated with friends yesterday. Today just chillin' out. I spend the 4th of July very quietly - I don't like crowds so do not go to fireworks displays or anywhere there might be a large gathering of people. Relaxing at home w/ my husband and daughter! A little outdoor picnic and some sewing! thanks! Love your blocks! Thread painting is a great idea! Usually, I'm home alone, but this year the 4th will be friends, food and fireworks. Fun! This year inside cause it is raining"
Usually we bbq at grannys and watch the fireworks from my MILs balcony as it faces the fairgrounds. We always spend the 4th and 5th at my mom's house (the holiday and my daughters bday on the 5th) because she has a pool for these really hot days. I spend the 4th just relaxing, or sewing, or both-its too hot outside to do much. Last night, I sat outside on my front porch & listened to the fireworks going off. We usually have a birthday party for my aunt since it is her birthday. We had a bbq with friends. We spend the weekend at our lake cabin, eating brats and burgers, drinking beer and wine, and lounging on the pontoon. Can't get any better than that! I spent it cleaning house. Company coming soon. looking good I do love these patterns, think my favourite quilt is her cosy afternoons BOM one, not learnt the art of machine embroidery we did some when on a course and used a hoop then am amazed people do it without a hoop as we were told the fabric had to be very taunt, drum like. Our local high school has music and fireworks for the afternoon and evening. It is a fun event. Your thread painting is awesome! Thanks for the tips. We usually spend the 4th of July at home, with a trip to the park for fireworks in the evening. Thanks for the tips about the thread weights and thread painting. The 4th of July for me is like every other holiday, filled with food, family, and friends! We usually cookout and watch fireworks. But this year it was raining so we had a cookout on Sunday and slept all day on Monday. Miss the fireworks but will catch them on Tuesday because soo many of them were rescheduled. 4th of July usually involves taking a walk to the local fair for some people watching, grilling some vegetables, and watching fireworks. We always go to a picnic with my Dad's side of the family in my hometown of Pittsburgh. My son even makes the trip from New Orleans to attend. We had a bbq, and family time! he fireworks display for our area was cancelled because of the weather, but will be rescheduled for a later time. I spent the entire weekend with family and good food. We eat out at a local BBQ place, will go to a movie, and watch fireworks locally. IT sounds boring, but it's a nice pace for us. I read a book yesterday. We saw "Tarzan" at the movies, which I highly recommend!! We played games with family, had a barbeque and watched fireworks. Homemade vanilla ice cream, stitching red, white and blue fabrics, and watching fireworks over the lake! Great tip for the thread painting! I've never tried it but you made it sound a little less intimidating!! We spend the day with family and friends at a potluck dinner. We play lawn games. I spent the 4th this year sewing and hubby worked on several of his projects. We celebrated with friends on the weekend with a potluck. I spent the long weekend at my lake house with family and friends. We enjoyed the fireworks on the lake on Sunday night. I spent this Fourth of July working, I am a nurse at a long term care facility, and t was my holiday to work! At least I got to see the local fireworks on my ride home! My favorite way to celebrate the fourth is with flags, decorating, a good cookout, watching fireworks with family. Special memories. This year we just stayed at home and relaxed. DH has shingles so he wasn't eager to do too much. I went to a cookout yesterday, and watched the fireworks from my deck when I got home. It was an interesting day. I hope you had fun. Thanks for the fun! I love your block with the thread painting. We barbecue for the 4th of July and watch the fireworks around the area in the evening. There are usually some good ones in the surrounding hills. We also sometimes watch the big one from the neighboring state that the local news broadcasts. This year it was totally spectacular. For many years we were fortunate to have a restaurant on the lake where we have a cabin. The restaurant owner put on a lovely firework show each July 4. Watching fireworks from your boat is awesome! Sadly the show was discontinued when the restaurant owner passed. I enjoy staying at home for our holidays, we work away from home through out the year so holidays are a retreat to home. We always have a barbeque at our house with lots of family and friends. We usually spend the 4th having a BBQ with family and friends. We spent the 4th with family, eating Barbecue and watching the fireworks. I went to my brother's to see his new house. Float boat, hot tubs, a wonderful mini vacation! With a little bit of hand stitching outside enjoying the view. We usually have a BBQ with friends. This year we stayed home because my husband was recovering from surgery. Picnic with the family and a trip to see the local fireworks. your block is wonderful. my husband and i spent July 4th grilling and working in our vegetable garden and butterfly garden. We laid a brick border and brick stepping stones. We spend our 4th doing what my daughter wants that is her birthday also. We look forward to a picnic with my parents in their backyard (brats, beans, and potato salad). The city fireworks are set off in the field behind their home. Love the idea of thread painting the embroidery! Spent the 4th week-end catching up on things around the yard and house, including cleaning up my sewing room. Did have friends over for dinner and watched fireworks from our back deck. Love the colors you are using for your blocks. Beautiful fabrics! Usually spend the 4th of July with a family picnic and then watching the fireworks on TV. dhardenburg (at) prodigy (dot) net. We went to the horse races and a party in our younger days, now we spend it quietly at home. Our daughter did come to visit for a while. We usually have a cook-out, but this year the temp was about 100 degrees, so we stayed inside. Spent it with my in laws having a barbeque. Got to see my son who moved out with his girlfriend and I don't get to see very often. It was a wonderful day. Spent the night trying to calm down a pappillion with one eye who because of the breed has huge ears and hates fireworks. We live in Utah and we hate July because between the 4th and our state celebration on the 24th and the days leading up and after those days, we have one very stressed out dog. Love the holidays but hate the fireworks. Usually my siblings and families all get together for a potluck/cookout/picnic and fireworks. I love the fabrics you are using in your blocks! So fresh. I spent the fourth with my husband and two grandsons on the lake. So fun! I spent the 4th of July at a cookout with 6 friends at a friend's house. We usually go to a local park for a fireworks display. This year we skipped it because of crazy work schedules. Independence day is a very special day and we spend it in the mountains with lots of campers. Good food and fireworks are the very best. I spend our 4th of July with our son and his family.